Every PP household worth its salt serves this tea-time delicacy with some regularity. I know I certainly had my share of these in my childhood – vegetarian pangoji on Mondays or Thursdays and pangoji with prawns on any other day. For a true PP, fish or prawns are welcome, no matter what time of day it is! Be warned, though, these are very addictive, and if you’re watching the calories, make sure you only make these in small batches. It’s the only way to manage portion control with this one. Grind the cumin and fenugreek seeds to a fine powder. It is this combination that gives the pangoji their distinctive flavour. Next, in a large mixing bowl, add the flour, salt, cumin-fenugreek powder, green chillies. Add a little water to make a thick batter. (It should be thicker than dosa/ pancake batter.) Add the baking powder and coriander and mix well. If you are using the prawns, add these into the batter now. Cover the batter and leave it to ferment for about 4-5 hours so that it turns slightly frothy. This helps make the pangoji light fritters instead of turning into stodgy oil sponges. After it has rested for the 4-5 hours, heat oil in a thick bottomed pan. Drop the batter one spoonful at a time and fry these on medium high heat. When they turn evenly golden, use a slotted spoon to drain the oil and place the pangoji on a kitchen towel. Serve hot, possibly with ketchup, if you can be bothered to fetch the bottle while the family attack the serving bowl. 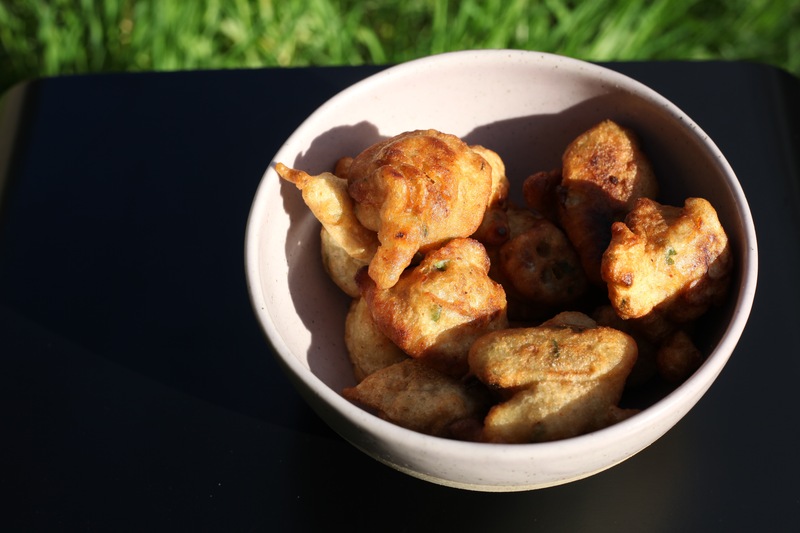 This entry was posted in A-Z 2016, Savoury snacks, Teatime snacks or Brunch ideas and tagged #AtoZchallenge, fritters, pangoji, Pathare Prabhu pangoji, Pathare Prabhu snack, Pathare Prabhu special, prawn fritters, spicy fritters. Bookmark the permalink. The coating is of flour… interesting, what if one adds besan to it!?! I love prawns. This looks so yummy, my mouth is already watering.